On these page, you will find some things I have coded in Visual Basic. Please feel free to download and use; any bugs, errors or requests for features, please contact me…. 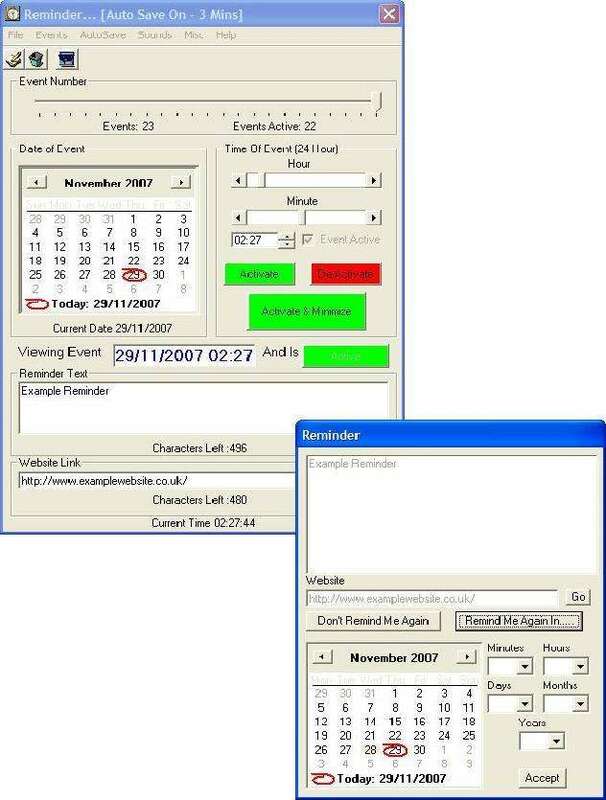 This was a little program I decided to write (currently at V3.7) as I was forever forgetting birthdays or things to record on TV. I spend far too much time on the PC! The program comes with it’s own self installer or as an executable (to download, use the download box to the right at the top) and everything is menu and button driven and is pretty self explanatory and easy to use. Sid Searcher is a little program I decided to write because I needed an application to allow me to search all my SID tunes in HVSC, using their load addresses. To download, use the download box to the right at the top. This Program is very easy to use, just point it to you HVSC and your Windows version of Sidplayer (normally has a /w at the end). Give it your criteria you need answers for (i.e. Load address of $1000 and less that $1000 bytes in size, and hit search. All results are displayed in the right box. If you double click a tune (and you have Sidplayer setup) it will start to play the tune. If you want to make a note of tunes that you have searched for future reference, then click ‘Copy to Clipboard’ and details are ready for you to paste into your ‘Text Editor’ of choice. This was a little program I decided to write because I had a load of Zeus128 source code, from my old PDS system and I needed to convert it into simple TXT format for new coding environment. 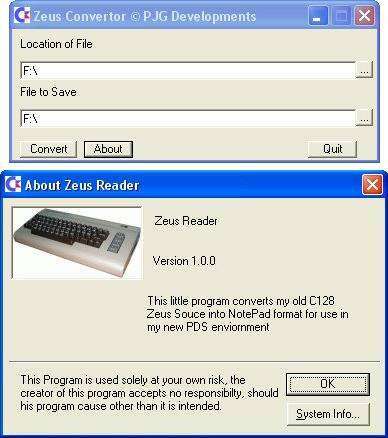 Quite simple to use: give it the location of the Zeus file, then give it an output location and new file name and click convert and voila! If you find any bugs or errors or have requests for new features, please contact me..